Hammerworks Country Wood Chandelier CH110 with seven arms is shown here in Richardson House Red Paint with Ivory Trim. In addition to several Old Village hand painted finish options, we offer Colonial Wooden Chandeliers in a variety of stained hardwoods. Furthermore, you can choose from either antique tin or antique brass hand bent arms for your Country Wood Chandelier. We also provide two feet of chain and a matching ceiling plate with each Antique Wooden Chandelier. Of course, for a minimal charge you can order more chain if you need it. In addition, we equip each candelabra arm with a socket rated for a maximum of 60 watts. Most notably, we make antique reproduction wooden chandeliers in a variety of sizes and styles. They range from the Country Wooden Chandelier CH112 (4 Arms), to Elegant Colonial Chandeliers CH322, with 16 arms in 2 tiers. Of course, there are several other single tier models with five, six, seven or eight arms as well. Due to this versatility in color and size, you can easily customize your wood chandelier to match any decor. Along with our Colonial Wooden Chandeliers, we also offer a large selection of Colonial Tin Chandeliers. 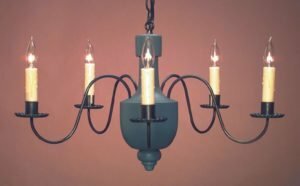 Most importantly, in addition to the antique tin finish for an Antique Home Reproduction Chandelier, we offer the option of antique brass as well. Consequently, you have more choices when coordinating with the color scheme of any particular space. 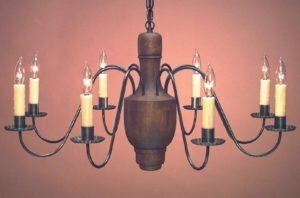 No matter what, whether you prefer the classic & formal style of Colonial Brass Dining Room Chandelier CH100, or the primitive look of Early American Tin Chandelier CH303, Hammerworks superb quality and craftsmanship shines through. Above, see Chandelier CH-110 in a Colonial period setting. 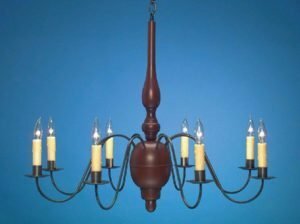 This Country Wood Chandelier in the light stain finish features 7 antique tin arms with burning candles. The candles in place of electric give it an authentic primitive Colonial look.